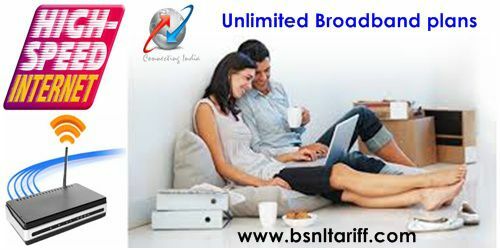 High speed Internet service provider Bharat Sanchar Nigam Limited has announced special Unlimited FTTH 400 GB Broadband plan on promotional basis for a period of 90 days under circle specific internet plans for Haryana Telecom circle new customers. As per BSNL website information, BSNL Telecom introduced new Money Control Broadband plan in Haryana circle providing FTTH services which offers high speed and unlimited internet usage at 25Mbps Mbps download speed for Rs.525/- monthly rental payment for all users. New Fibro Combo ULD 525 plan gives unlimited usage data for FTTH 400GB plan customers which enables user to browse internet at 25Mbps download speed till 400 GB (after free limit speed automatically reduced to 1Mbps following FUP limit) by paying bsnl monthly bill of Rs.525/-. PSU BSNL provides cashback offer as per prevailing scheme by paying Half-year, Annual etc. Under this Fibro ULD 400GB plan subscriber will get unlimited free calls additional benefit of making 24 hours free unlimited voice calling to any network within India for Local/STD services. Conclusion: Dear Reader, if you're new or regular follower our blog and really enjoyed our BSNL's best FTTH Broadband Unlimited plan offers 400GB data and 25Mbps download speed, article then subscribe to us.